Exactly a year after an anti-Israeli bus bombing killed six people, Bulgaria is struggling to identify the attacker or confirm his suspected links to Hezbollah or Iran. 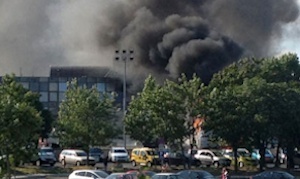 The bombing at Bulgaria's Black Sea Burgas airport on 18 July 2012 was the deadliest attack on Israelis abroad since 2004. Five Israeli tourists and their Bulgarian driver were killed and some 30 other people were injured. The bus was carrying a group of more than 40 Israeli tourists from the airport after they had just arrived in the country. On Thursday, officials from Bulgaria and Israel as well as relatives of the victims will open a monument at the site of the attack, on the first anniversary of the bombing. However, 12 months on, investigators are increasingly frustrated at efforts to track down those responsible. The bomber - who was also killed in the attack - was a Caucasian-looking man caught on airport cameras loitering in the arrivals hall with a big backpack on his shoulders. Bulgarian investigators managed to recover DNA and fingerprints from his remains along with a fake American driver's licence in the name of Jacques Felipe Martin. This data and a computer-generated image, however, failed to return a match from Interpol databases. Two identical driver's licenses - made in Lebanon and used by two of the perpetrator's suspected accomplices - allowed investigators to track down the real identities of Canadian and Australian passport holders residing in Lebanon since 2006 and 2010. "What we can make as a justified conclusion is that the two persons whose identity we have established belonged to the military wing of Hezbollah," Bulgaria’s then Interior Minister Tsvetan Tsvetanov said last February. DNA recovered from one of the licenses in the name of Ralph William Rico matched that of the bomber, the minister added, supporting the theory concerning his presumed Hezbollah links. "The justified conclusion stands," the new Foreign Minister Kristian Vigenin confirmed last week, while insisting that the EU should not base a decision on whether to blacklist Hezbollah on these circumstantial findings alone. Talks on whether to add the military wing of the powerful Lebanese Shiite movement to the bloc's list of terrorist groups will also take place on Thursday. "The identity of the direct perpetrator has not been established yet and this hinders the probe to some extent," Bulgarian Interior Minister Tsvetlin Yovchev said in an interview on Tuesday. "There is progress. We have received additional data from foreign partner services that confirms the proposition already made," he added. A coroner's examination of the man's severed head recovered from the site of the accident indicated a young person, aged around 25, about 1.8 meters tall, with fair skin and mixed eyes. Airport CCTV footage showed him wearing typical holiday wear - shorts, baseball cap and eyeglasses. Witness reports suggested his shoulder-length hair was probably a wig. Investigators initially thought the man was a suicide bomber but a closer examination of the blown-up bus and a later re-enactment of the bombing with silicon mannequins confirmed that he either died by mistake or his device was detonated by a remote-controlled device, at a distance. The re-enactment confirmed that about 2.2 kilograms (4.9 pounds) of trotil equivalent - a common material in bombs used as a standard measure of explosive strength - was used in the attack. Investigators have so far been unable to establish whether the bomb was made abroad and smuggled into the country or assembled on the ground, with local or imported materials. Israel's almost immediate repatriations both of the victims and the survivors prevented Bulgarian prosecutors from questioning them. Their written testimony was only received earlier this month and is still being translated, Burgas regional prosecution chief Kalina Chapkanova told the '24 Hours' newspaper last week. The investigation's initial end-of-June deadline has been extended by another five months.